The brooms and brushes are out in force as Cuba’s largest city gears up for a major milestone. Cuban tourism minister Manuel Marrero visited Toronto Friday, providing an update on all that’s happening in his homeland, including preparations for Havana’s celebrating its 500th anniversary in 2019. “This winter you will find that our capital looks different and this is because it’s in a process of working to recover its heritage, opening new hotels, shopping and cultural centers, all as part of the preparations for the celebration of the 500 years,” Marrero said of a city which has been seeing ongoing restoration for decades. Havana, which will be the latest of several Cuban cities to reach five centuries, is expected to see year-long celebrations – including concerts – as it marks 500 years of existence. The anniversary will coincide with ongoing tourism infrastructure development in Havana and other parts of Cuba, with a recent addition to Havana’s hotel scene including an upscale Iberostar property found in an Old Havana landmark building. Cuban officials note that the country is not only adding hotels but renovating many existing ones. Canadian visitations to Cuba have fallen 8% this year but Marrero said Canada remains his country’s premier market and noted that September visits to Cuba were up 75% from September of last year, when parts of the north coast were battered by Hurricane Irma. The jump in visitations is seen as proof that any lingering concerns over hurricane damage have been forgotten. In all, Cuba has seen some 3,553,772 foreign tourists this year, just shy of the number it saw in all of 2017, and up 19% from 2016. Marrero said winter air capacity from this country to Cuba will probably but not necessarily be similar to that of last year. Marrero also praised Cuba as being a particularly safe country. 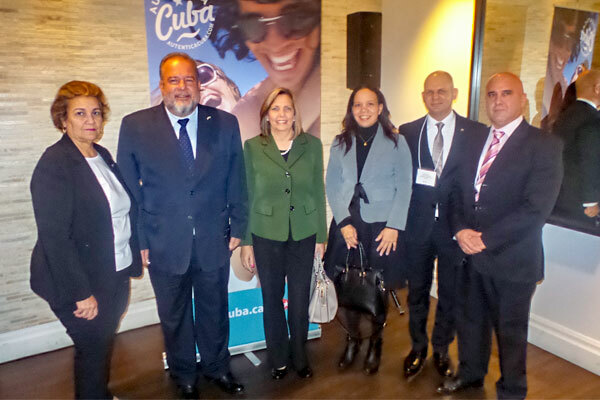 Seen here are Barbara Cruz, general commercial director of the Ministry of Tourism; Marrero; Cuban ambassador Josefina de la C. Vidal Ferreiro; Tania Lopez Larroque, Cuba’s consul general in Toronto; Eloy Govea, director of the Cuba Tourist Board in English Canada; and Michel Bernal Quicutis, commercial director of the Ministry of Tourism.